While RIM rolled out PlayBook OS 2.0 to our beloved tablet some time ago, we're still uncovering some hidden features, and today I've uncovered a neat lesser known feature. If you're like me you have meticulously placed all your applications into respective folders, sorting them from "HD Games" to "entertainment". While it keeps everything organized getting in and out of a folder could be just a hair faster, and I've found out a way to accomplish this. Instead of clicking on the small little "X" on the folder you can actually swipe from the center of the bottom bezel to the left side of the PlayBook (see image above). Doing so will cause the folder to quickly close letting you get back to what's important, using your PlayBook. 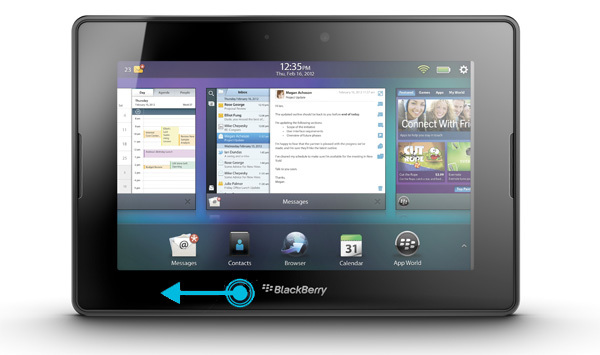 Now this has got me thinking, what other secrets are laying within the PlayBook OS 2.0? If you've found one let CrackBerry Nation know in the comments or in the forums at the link below. It'll be interesting to see what else can be found.